I've got yarn calling to me from my stash. They are only partial skeins, left over from other projects, but their voices are still quite loud. I've got friends who really should receive holiday gifts from me. They are good friends, who love me even when I don't give presents, but their voices are also quite loud. I must quiet the voices! Thus, the knecklace is born. It is a beautiful, adaptable thing. Like all the best "knitting it for a gift, multiple times over" kinds of things, it takes little yarn, knits up simply and quickly, and can be adjusted for just about any fiber you can get your little paws on. The best part is that each knecklace can be customized to fit the personality of each of your friends. The earthy, artsy friend? Use the Manos del Uruguay variegated yarn. The sophisticated, minimalist friend? Use the Blue Sky Alpaca yarn. The gotta-have-the-finer-things friend? Splurge on a skein of angora or some other spendy yarn. Go ahead, it's only one skein. Note: Necklace requires approx. 30 yds/27m of desired yarn. 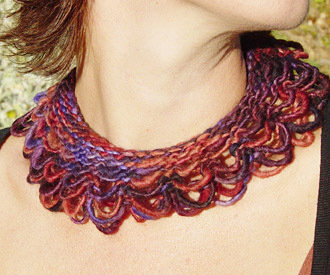 Note: Before measuring gauge swatch, BO your swatch using the bind off method you will use for your necklace. It is best to bind off loosely; try using a needle several sizes larger than your working needle if you have trouble binding off loosely. Slipped stitches in this pattern are slipped purlwise. Drop the next st from your left needle. If you are unfamiliar with this cast on method, instructions can be found here or here. If you would like to use up a bit of yarn from your stash, knit up a gauge swatch in stockinette st using the needle size of your choice, and bind off. The important part of the gauge for this pattern is along the cast-off edge, since this is the portion that determines the length of your necklace. Measure your swatch just under the cast off edge and determine the # stitches per inch. If necessary, add or subtract 1 or 2 to this number, so that you have a multiple of 4 sts + 2. Using the Long-Tail Cast On Method, loosely cast on 94 sts. Row 1 [RS]: Sl 1, p to end. Row 2 [WS]: Sl 1, p1, k to last 2 sts, p2. Row 3 [RS]: Sl 1, p to end. Row 4 [WS]: Sl 1, p1, [k2, k2tog] to last 4 sts, k2, p2. 72 sts rem. Row 5 [RS]: Sl 1, p to end. Row 6 [WS]: Sl 1, p1, k to last 2 sts, p2. Row 7 [RS]: Sl 1, p3, [drop next st, p2] to last 2 sts, p2. 50 sts rem. Row 8 [WS]: Sl 1, p1, k to last 2 sts, p2. Row 9 [RS]: Sl 1, p to end. Row 10: Loosely BO all sts, leaving a tail at least 10 inches long. Gently unravel the dropped stitches back to the CO edge. When you reach Row 4, where [k2tog]s were worked, each dropped st will become 2 dropped sts; unravel these additional dropped sts as well. Carefully steam press your knecklace. Take your time with the cast off edge; use this opportunity to shape the loops formed by the dropped sts, but don't press the life out of them! 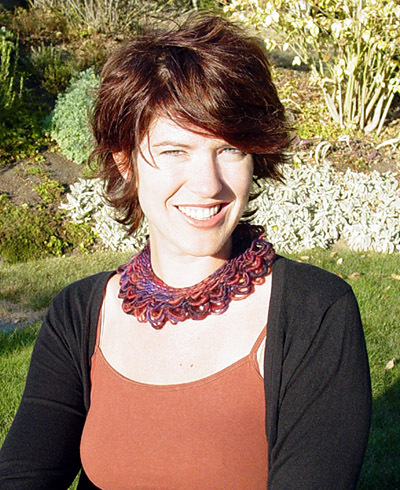 Sew button to RS of upper corner of necklace, on end without yarn tails. Use tapestry needle and yarn tail from bind off to create a small button loop, anchoring base of loop securely and using several thicknesses of yarn. 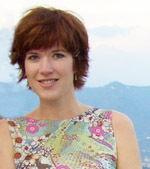 Hilary is a wife and mother of two and a college biology instructor in Washington State. Sometimes she listens to the voices in her yarn stash. She almost always listens to the voices of her friends.